Balloon mitral valvuloplasty (BMV) is almost always performed under monitored anesthesia care in a supine position which allows anatomical fluoroscopic orientation of the cardiac structures to the interventional cardiologist. However, authors came across a tricky situation where a 47-year-old male patient with severe kyphoscoliosis of the dorsal spine was posted for BMV. The patient presented with New York Heart Association Grade 2–3 dyspnea, palpitations, and orthopnea. He had severe kyphoscoliosis [Figure 1]a involving lower thoracic vertebrae (T4–T12) and pulmonary function test showed severe restrictive lung disease with poor bronchodilator reversibility. The patient had a history of abandoned BMV in view of a difficulty in septal puncture and entering into the mitral valve. At author's center, this time, it was decided to perform BMV under both fluoroscopy and transesophageal echocardiography (TEE) guidance. Primary anesthetic challenges were to position the patient comfortably with his back hump and at the same time avoid general anesthesia with endotracheal intubation in the presence of severe restrictive lung disease. Thus, procedure was performed under conscious sedation. After taking a valid consent, ensuring adequate starvation, patent 18-G intravenous cannula, and cardiothoracic surgical backup, the patient received topical oropharyngeal anesthesia in the form of 2% viscous lignocaine gargle in the preoperative holding area along with injection glycopyrrolate 100 mcg and aspiration prophylaxis and then wheeled inside cath lab where difficult airway and crash cart were kept ready. As the patient was not able to lie down supine, care was taken to support his spine by ensuring that area of maximum convexity of a hump was padded well and areas of concavity supported to follow anatomical curvature of the spine. The neck was supported by keeping a pillow under the shoulder to keep the neck and chest in the same plane. A thick cushion was placed under the lower back and hips for optimal access to the femoral vessels. Overall, a slight reverse Trendelenburg position was achieved. Oxygen supplementation was started through nasal prongs at 2–3 L/min. Before inserting TEE probe, 10% lignocaine was again sprayed onto the posterior pharyngeal wall. With our previous experience, conscious sedation was achieved using combination of injection midazolam 2 mg, fentanyl 50 mcg, propofol 0.5–0.8 mg/kg IV, dexmedetomidine at 0.5–1 mcg/kg/h, and titrated toward Ramsay sedation score 2–3. TEE probe was tolerated well without any discomfort and care was taken not to image transgastric TEE views. The procedure was successfully completed through usual femoral route although an option of transjugular approach was kept reserved. Procedure time was 90–100 min, but the patient tolerated it well without any complications. 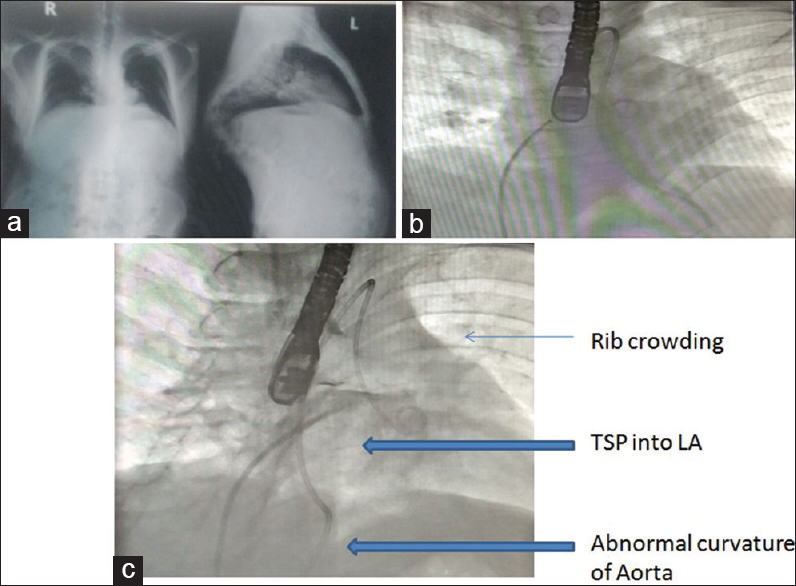 Procedural challenge in this case included distorted thoracic anatomy due to ribs crowding and abnormal spine curvature [Figure 1]b which made identification of bony landmark during interatrial septal puncture irrelevant [Figure 1]c, and risk of inadvertent cardiac tamponade was increased due to inaccurate puncture site. Moreover, fluoroscopic image distortion caused due to reverse Trendelenburg position needed to be mitigated using caudal views to get similar anatomical views. These patients have difficulty in lying down for a prolonged period due to pain over a hump and overhanging unsupported neck. Severe restrictive airway precludes general anesthesia too. Moreover, positive pressure ventilation can worsen preexisting pulmonary hypertension in patients with severe mitral stenosis. Conscious sedation is an attractive option which overcame these challenges and avoided general anesthesia and its complications, hemodynamic perturbations, risk of prolonged ventilator support, and intensive care unit stay. Furthermore, proper positioning is imperative in such situations where padding and cushioning of the spine is a key to patient comfort and prevent soft tissue and bony injury. Desai PM, Umbarkar SR, Sarkar MS, Lohiya R. Conscious sedation using dexmedetomidine for percutaneous transcatheter closure of atrial septal defects: A single center experience. Ann Card Anaesth 2016;19:463-7. Joseph G, Varghese MJ, George OK. Transjugular balloon mitral valvotomy in a patient with severe kyphoscoliosis. Indian Heart J 2016;68 Suppl 2:S11-4. Jagadeesh A, Manjunath N, Rao VR, Sathyakumari SA. Anaesthetic management of closed mitral valvotomy for severe mitral stenosis with traumatic kyphoscoliosis. Indian J Anaesth 2010;54:62-4.